The Pennsylvania Department of Environmental Protection (DEP) announced this week that it awarded more than $2.6 million for 16 clean energy projects as part of the 2018 Alternative Fuels Incentive Grant (AFIG) Program. Notably, these projects – 13 of which were for recipients to purchase new compressed natural gas (CNG) or propane-fueled vehicles and one for an upgrade to a CNG fueling station in Lackawanna County – “will help improve air quality and public health statewide,” according to DEP. 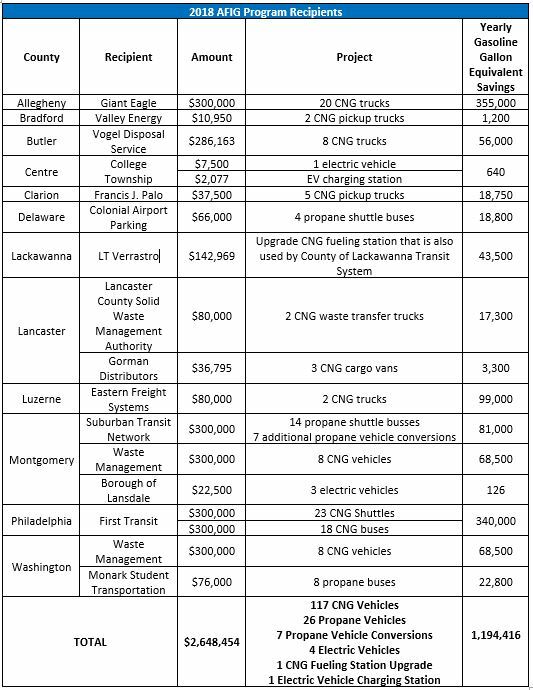 DEP estimates Pennsylvania will see emissions reduced by more than 2,800 tons and see a reduction of more than one million gallons of gasoline equivalent annually as a result of these 16 projects. This latest round of AFIG Program grants represents only a fraction of the investment taking place in the Commonwealth that will result in improved air quality and fuel savings for local businesses. And this investment is being driven by the abundance of natural gas produced in Pennsylvania. 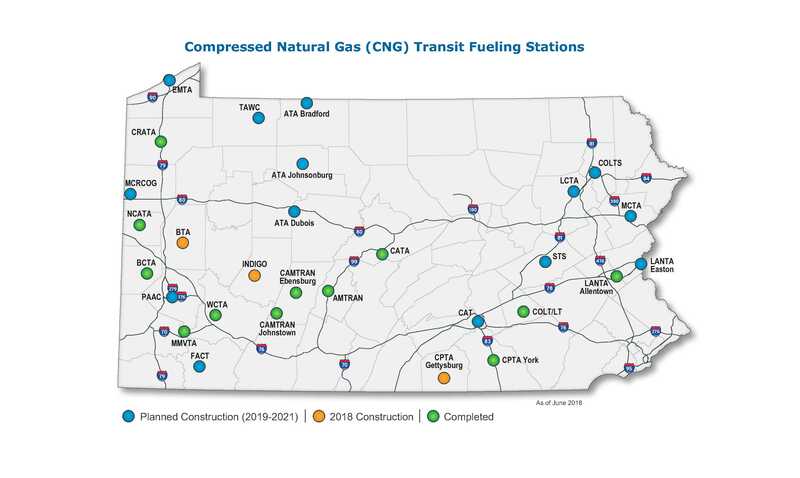 For instance, Pennsylvania Department of Transportation (PennDOT) has completed construction on about half of the 29 planned CNG fueling stations it has been collaborating with Trillium CNG on over the last few years. And earlier this year, DEP awarded CNG Fuel in Clarion County $178,785 for its CNG fueling center that will “promote more use of CNG tractor trailers along I-80, which will remove hundreds of thousands of pounds of air pollution,” according to McDonnell. All told, DEP estimates that when complete, this project will help to reduce emissions by more than 86,000 pounds of carbon dioxide and more than 322,000 pounds of nitrous oxide along the I-80 corridor. 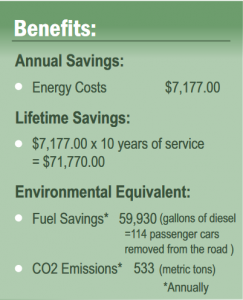 One of the success stories DEP highlights on its website is the Pocono Mountain School District in Monroe County that used AFIG funds to offset the cost of replacing 25 diesel-fueled school buses with propane-fueled buses. That conversion will allow the school district to save more than $7,000 annually in energy costs and reduce CO2 emissions by 533 metric tons annually. When River Valley Transit (RVT) in Lycoming County received 10 new CNG buses earlier this year, DEP tweeted that the RVT fleet will see a reduction of 2 pounds per day of sulfur oxides, 4 pounds per day of particulate matter, 5 pounds per hour of nitrogen oxides and 8 pounds per minute of carbon dioxide. Importantly, this is not a comprehensive list and there are many similar projects occurring across the state. 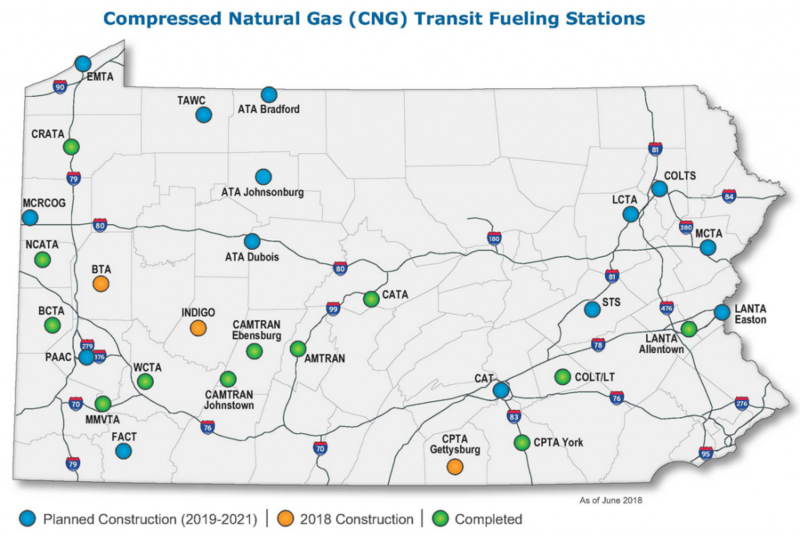 In fact, according to the U.S. Department of Energy (DOE) Alternative Fuels Data Center, Pennsylvania has 79 CNG, 99 propane and three liquefied natural gas (LNG) fueling stations across the state – about 70 percent of which are publicly owned. Further, some companies developing Pennsylvania’s shale have been using natural gas to power their equipment and vehicles for years. What does that mean? Companies have been able to use CNG, LNG or propane in combination or in place of diesel to power their fleets of vehicles, drilling rigs and even hydraulic fracturing equipment. And much like the previous public and private sector examples, the use of these alternative fuels have resulted in increased savings and reduced emissions. The bottom line is that these clean energy projects have become even more attractive in Pennsylvania thanks to the abundance of natural gas within the state’s borders. It’s just one more way that the Commonwealth’s shale industry is helping to spur investment, reduce emissions and provide jobs and economic benefits.